A cast of characters brings ‘South Pacific’ to The Villages. Anyone calling the Barth residence in The Villages over the next couple of months may want to be very specific about who they’re trying to reach. They could wind up talking to Emile de Becque. Broadway fans will recognize Emile’s name from “South Pacific.” The character also is the new alter ego of Richard Barth, who’s playing Emile in The Villages Musical Theater’s production of the play from March 22-24 at Savannah Center. Since landing the part of the Frenchman last year, Richard often can be heard speaking with a French accent when leaving phone messages, ordering at restaurants, or explaining the plot of the classic, time-tested musical. This year marks the 70th anniversary of the first Broadway performance of “South Pacific,” with music and lyrics by Richard Rodgers and Oscar Hammerstein II. The Villages Musical Theater also is marking a milestone, coming full circle since staging “South Pacific” as its first show in 2002. 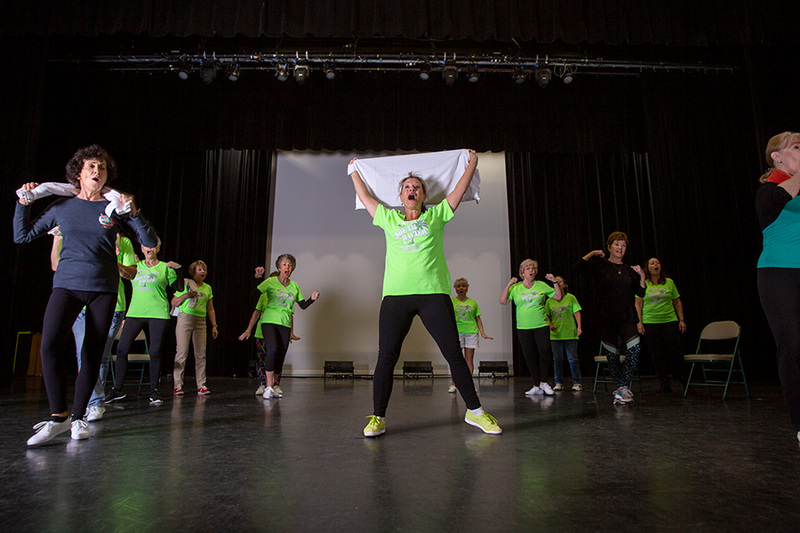 About 160 Villagers volunteer both on and off stage with the VMT, and all productions are performed with a live orchestra of 20-plus members. Longtime member Sandie Hawthorne is directing the play, and Dellie Saxe plays the female lead, Nellie Forbush, to Richard’s leading man, Emile. Sandie initially told the whole cast that Richard was from France—he’s from Cleveland—before clarifying that while he’s not from France, he would be speaking in a French accent at all times. While Richard likes to stay in character, he’s actually stepping out of his own character to take on the role. He comes from a classical music background, without any acting experience, and is better known in The Villages for his rock band, Bill Board and the Headliners. When he moved five years ago to The Villages, Richard wanted to stay involved in music. Bill Board and the Headliners—the name literally was inspired by Richard seeing a billboard with a sign underneath that read, “headliners”—play classic rock at private parties and neighborhood gatherings. Leo Brown is the guitarist and lead singer, Jim Berg plays bass, and drummer Paul Berns was a percussionist for 40-plus years with the Indianapolis Symphony Orchestra, as well as Richard’s best man at his wedding 50 years ago. A former member of the band was involved in theater and mentioned “South Pacific” to Richard, who auditioned as a “fluke” because Emile’s part suits his voice. Sandie has no reservations about Richard’s lack of acting experience. “He has an innate ability to do this part and his voice is beautiful,” she says. In his French accent, Emile, uh, Richard, tells the story of Emile, a “very upright, old-fashioned, stoic man” who stands up to a town bully in France but accidentally kills him, escapes on a cargo ship, and winds up on an island in the South Pacific. He marries and has children with a Polynesian islander, who later dies. Emile and Nellie fall in love, but she’s a country girl from Little Rock, Arkansas, and is shocked to find out Emile has children from a marriage to a Polynesian woman. The play’s themes are as timely today as they were when “South Pacific” opened in 1949. “It is a relevant story today because it is still about this racial prejudice, how do we deal with this, and it’s also this story about this bully who takes over the town and how do we react to this,” Richard says. Nellie learns a life lesson by working through her feelings about Emile and his children, Dellie says. “It’s such a relatable story because it’s about relationships and about life and things you think you can handle, and then you come to a point where [you say], ‘I can’t do it,’ and you adjust and through those struggles you realize what’s really important in life, and it’s relationships,” she says. “South Pacific” holds a warm spot in Dellie’s heart. She played Nellie as a teenager and during a student showcase in Chicago, she was thrilled to meet actress Mary Martin, who originated the role on Broadway. She’s bubbly in describing the character. Dellie and her husband, Dave Saxe, who plays Luther Billis, live in the Village of Osceola Hills and are participating in their first production with the VMT. Like many members of the troupe, however, they have professional experience. They operate a summer stock theater in Pennsylvania and performed for several years in Chicago as members of the Actors’ Equity union. Despite the heavy themes of “South Pacific,” it is a musical comedy, and that’s where Dave comes in. As Billis, a Navy Seabee and “entrepreneur” on the island, he provides comic relief. Billis will resonate with any military veterans who didn’t like their officers, Dave says. Sandie says Dellie and Dave are “perfect” for their roles and part of a “fantastic” cast. Sandie, of the Village of Mira Mesa, has been with the VMT for more than 15 years, and last year was honored as Member of the Year for her work as a director and former board member. Sandie’s an admitted “theater person.” She studied theater at Illinois Wesleyan University and planned to attend a New York arts academy before she was diagnosed with multiple sclerosis during her senior year. That ended her academy plans and curtailed her dreams of performing, though she became an Equity actress and appeared in several professional shows. “I couldn’t really get rid of the passion that I had for theater, so I stuck with it for a long time,” she says. She uses a wheelchair most of the time but is comfortable performing on stage in it. Since moving to The Villages, she has acted in plays and won a Sarah Award for “Over the River and Through the Woods” at Melon Patch Theatre in Leesburg. Sandie now focuses on directing and her credits include “Annie Get Your Gun,” “The Music Man,” “Carousel,” “Thoroughly Modern Millie,” “Oklahoma,” and “Always Patsy Cline.” She expects to add “South Pacific” to her list of favorite productions with the VMT. Sandie says she gets a boost from working with theater people—talkative, animated, fun people who like to laugh and have a good time. “I’m disabled, but it makes me feel much better when I’m around really active people, because that’s the way I wish I were and I hope that they still think I am,” she says. Sandie encourages anyone who loves the theater to participate in the VMT, which stages two shows each year. The fall show will be a musical revue, and “The Producers” is planned for March 2020. “People really enjoy taking on roles other than their own personalities,” Sandie says.